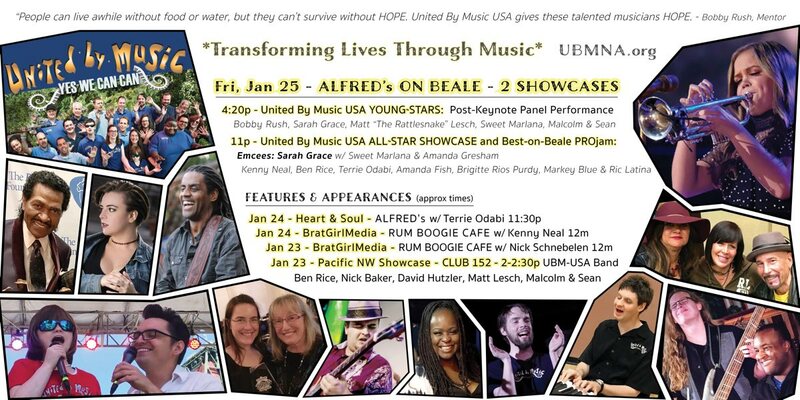 The Blues Foundation has again invited UBM USA’s producer/director, Amanda Gresham, to “field a team” of UBMNA band members to present Showcases in Memphis during International Blues Challenge Week. We’re gonna be a little bit of everywhere! For many, the mecca of blues music is Memphis, TN. From there you can slip right on down into the musically and culturally rich Mississippi Delta and wander your way along the Mississippi to New Orleans. Going north out of Memphis you could follow the path through the blues-rich town of St. Louis, take in the new 24,000sf National Blues Museum, and eventually make it into Chicago. But for this week, the epicenter of the blues world is on Beale Street in Memphis, TN. In 2019 almost 300 bands are expected representing most states in the U.S. and many from around the world. The IBC is judged by blues professionals from across the world who have years of experience in listening to, producing, and creating blues music. The Blues Foundation has established a set of criteria by which all acts are evaluated throughout the five days of the IBC. United by Music USA band does not compete with the other bands. We enjoy a special status since our group is a band within a program with a purpose. 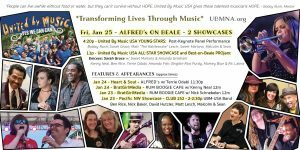 We are invited to present two of our own full Showcases, plus a ProJam in order to spread awareness of the UBM USA program and the band that is within the program. We’re leading a Blues Inclusion Revolution ™ and invite all to come along! We’re so glad to have with us our returning Sweet Marlana from Kentucky. She’s wowed the crowds in Memphis the past two years in UBMNA shows and it’s certain that will be the case on Beale Street when her United by Music band takes to the stages on Beale. Miss Marlana has maintained a steady travel schedule in order to be able to satisfy all of the invitations she receives to perform the National Anthem in major league ball games, keep current with developing her own CD, performing for hospital benefits, Best Buddies’ walks and in churches and other interesting places. A very special week on tour with United by Music in summer 2018 had it’s anchor date performing several time for event at the USA Games for Special Olympics. Even with all this, she and Amanda are always planning what’s next for Marlana being able to be with her UBMNA friends and offer up some music. Also returning this year is Ms. Sarah Grace from Texas. Sarah Grace and her band, then Campfire Soul, now known as Sarah Grace and the Soul, served as the backing band for UBM in 2018. Sarah Grace has had a very busy year appearing on NBC’s THE VOICE. Through weeks and weeks of competition, she showed the world the bluesier side of The Voice and rose through the weeks into the FINAL 8! Sarah’s performances drew critical acclaim for originality and performance and earned her 10’s of thousands of dedicated Team Sarah Grace fans! In two scheduled performances with United by Music USA, where she serves as the first Youth Mentor, we will be treated to some of her original material as well as some innovative approaches to songs we already know. We have a new artist this year, Mr. Matt “The Rattlesnake” Lesch on guitar and vocals. Another of our band members who is usually on tour with us, Mr, Kingfish Ingram is touring on the west coast this year during IBC week, but I’m sure we’ll catch up along the music highway. Matt is from St. Louis, MO, has just released his debut CD and is just 18 years old! Welcome Matt Lesch! Returning to Memphis are some of our core band members from the Pacific Northwest, David Hutzler, Malcolm Monaghan and Sean Reed. Another of our core Pac NW band members is having his IBC debut shows this week, Mr. Nick Baker. Nick is not only a superb keyboardist and vocalist, he writes many of his own songs, has recorded several CD’s and has just released the second of two children’s books he has written with his mother. The stories are autobiographical and with good messages and the value of inclusivity and the challenges children face from people who are sometimes not kind when you seem a bit different than others. Soon, there will be more information about these books on our website. Come see us in Memphis! In the banner art above, you may reference the dates, times, locations where we’d love for you to catch up with us during the week. Check our Facebook Page: United by Music North America for updates in schedules and additional musicians scheduled for our ProJam! See ya on Beale!